WikiLeaks founder Julian Assange makes his way into the Westminster Magistrates' Court after being arrested April 11 in London. What does the arrest of Julian Assange mean for the role that WikiLeaks might play in future election interference targeting the United States? National security officials say they're confident that foreign activity will continue through 2020, but no one knows how familiar it may look, how much it may evolve — or whether a WikiLeaks without Assange could play a similar role. The answer, cyber-observers say, is probably yes ... but. "WikiLeaks does have a reputation for credibility," said Jake Williams, founder of the cybersecurity firm Rendition Infosec. "They also have a reputation for being a mouthpiece of the Russian government." WikiLeaks, by its account, is bigger than Assange, claiming more than 100 staffers around the world. But he is its best-known staffer and public face, and he has been taken out of the loop for now. 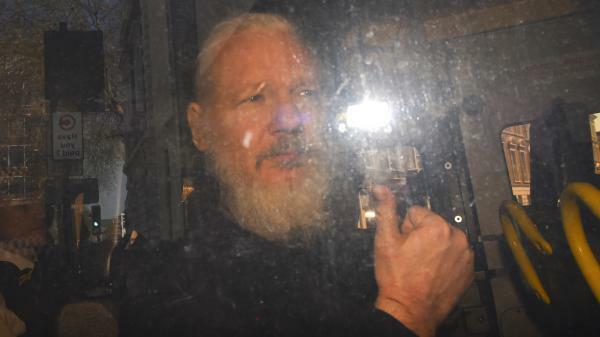 Assange has been charged with helping a then-U.S. Army intelligence soldier, Chelsea Manning, access U.S. government systems to download secret material. WikiLeaks then published huge numbers of those documents. Assange would need to be extradited from the United Kingdom to the U.S. to face the charges. That process, and then his eventual trial, could mean months or years during which he would be absent from the workings of the site he launched. Even so, the degree to which the arrest of Assange renews attention on the legacy organization, rather than on just him, may increase its profile, Williams said. He likened it to the way Barbra Streisand wound up drawing more attention to her beachfront mansion by trying to suppress photos of it. "Taking him out of play may actually have the Streisand effect, where more people are now aware of [WikiLeaks] than would have been before," said Williams. Even so, more people than ever also may become aware that WikiLeaks served in 2016 as a fence for the Russian military intelligence agency GRU. The agency used cyberattacks to steal data from Americans, which it then gave to WikiLeaks to release based on its reputation as an independent arbiter of secrets. The operatives used WikiLeaks to release troves of embarrassing emails: a data dump that led to the resignation of Democratic National Committee Chairwoman Debbie Wasserman Schultz and a dramatic shift of media focus for much of the 2016 presidential race. American intelligence officials have been clear that efforts to affect elections in the U.S. have not stopped. "We assess that foreign actors will view the 2020 U.S. elections as an opportunity to advance their interests," Director of National Intelligence Dan Coats told a Senate committee this year. "We expect them to refine their capabilities and add new tactics as they learn from each other's experiences and efforts." The kind of phishing attacks that led to those data breaches remain among the most popular forms of cybertactics, and there were attempts to use them in 2018 too. Then-Sen. Claire McCaskill, D-Mo., said Russia sent her staff fake emails last summer in an effort to gain access to passwords. WikiLeaks has long been seen as the gold standard for releasing secret information. The site has built a broad reach, worked with many legacy media organizations and generally made a strong effort to protect sources, Williams said. The organization may even use Assange's arrest as a way to raise money, said David Fidler, a cybersecurity expert at the Council on Foreign Relations. "Those who support what WikiLeaks has done in the past will take [this] as a call to arms, as a rallying cry, that it ought to double down on the mission that Assange and the other founders of WikiLeaks originally created," Fidler said. "I could see them using Assange as a sort of whistleblower or martyr figure to increase the scale of what they're trying to do." WikiLeaks still retains a lot of goodwill around the world, based on the revelations that came from those documents, which may motivate fellow travelers into those same kinds of disclosures in the future. But because of WikiLeaks' real or perceived ties to the Russia government, both Fidler and Williams said that if an adversary wanted to push information into American discourse — and have it taken seriously leading up to the next election — it might use a different route from WikiLeaks. That could mean creating a new avenue, like Russian operatives tried to do with the website DCLeaks, or using established social media or other websites. "I probably would avoid WikiLeaks and likely use another distribution method," Williams said. "What that is, is still yet to be determined." Three years ago, WikiLeaks played a major role in the attack that Russia waged on American democracy. When cyber attackers stole emails from the Democratic National Committee and from Hillary Clinton's campaign staff, they used WikiLeaks to release them. Well, now that group's founder, Julian Assange, is in the hands of British authorities. And so what does that mean for the future of WikiLeaks, and what's it mean for potential election interference in this country? NPR's Miles Parks covers voting and election security. He's in our studios this morning. Hi, Miles. MILES PARKS, BYLINE: Good morning. GREENE: So as officials are thinking about security in the 2020 election, is WikiLeaks prominent on their minds? PARKS: Yeah. So the first thing that needs to be said here is basically that 2016 is not being viewed as a one-off. The sort of cyberattacks that gave Russia access to the Democratic National Party's emails, as you mentioned, they continue to be very, very popular forms of cyberattacks. Even just last year, former Senator Claire McCaskill, in the middle of a very tight Senate race, said Russian attackers sent her campaign staff fake emails trying to gain access to passwords and trying to gain access to her data. In these sorts of schemes, when thieves do get access into a server, and they get a hold of this data, they need a place to release it. And that's where WikiLeaks comes in. GREENE: So was WikiLeaks special in some way? Like, why is that the organization that Russia chose? PARKS: There's a couple things. The first thing is reach. WikiLeaks has a brand that people know, and that matters when you want your data to make a splash. The second thing is credibility. They've spent the last more than a decade posting leaks - Guantanamo Bay-related, Iraq War-related - that have kind of been sort of viewed as holding power to account in the U.S. And they've, more importantly, been viewed as authentic. So when Russia wanted these emails to be viewed in the same light, they went - going to WikiLeaks made sense. I talked to Jake Williams, who runs a cybersecurity firm called Rendition Infosec. And he said, though, that WikiLeaks' reputation for that credibility may actually take a hit here. JAKE WILLIAMS: Wikileaks does have a, you know, reputation for credibility. They also have a reputation for being a mouthpiece of the Russian government. GREENE: When you talk about reputation, I mean, how much of the reputation of WikiLeaks was connected to Julian Assange? How much of a hit could WikiLeaks now take because he's in custody in the U.K.? And what does it mean for the future of the organization - maybe its role in what cyber attackers are trying to do? PARKS: So what I heard from multiple people is that the actual infrastructure of WikiLeaks may not be affected all that much by the arrest of Assange. And cyber attackers in the very near term, people who want to make a difference in the cyber realm, may actually be motivated in the short term by Assange's arrest. But looking at the big picture, WikiLeaks is now really closely associated with the Russian government because of their role in the 2016 election, and that may kind of taint the information that they post in the future. So most - excuse me - most whistleblowers want the information that they publish to be sort of free of political bias. They want it to be focused on just the information. So what I heard from multiple sources is that WikiLeaks may not be the best place for publishing that sort of whistleblower information in the future. GREENE: And Miles, we're getting a redacted version of special counsel Robert Mueller's report this Thursday - at least, we're told. I mean, this is an important moment on your beat, covering voting and election security. What are you looking for? Could you learn a lot about 2020? PARKS: Yeah, absolutely. I think a lot of focus has been spent on collusion and obstruction up to this point. I'm going to be focused more on the big picture - not necessarily President Trump's role in all of this, but Russia's role in how they targeted - any more details we can learn about how Russia targeted our election infrastructure is going to be important playing defense in 2020 and going forward. GREENE: NPR's Miles Parks. Miles, thanks as always.